Comics Make Me Happy! : Happy Valentine's Day...or something. Okay, I don't really like Valentine's Day. But two recent Valentine's Day-themed posts at One True GL and the Hoosier Journal of Inanity inspired me to post a picture of my favorite DC couple. 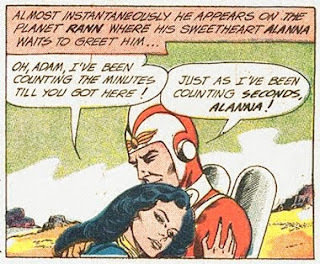 Considering that Adam gets Zeta-beamed to Rann from Earth about every month or so, that's a lot of seconds. Or maybe he's just exaggerating for dramatic effect. I tend to take people literally. You know I'm not big Valentine's Day person either. So, all I can say is...space parasite! Space Parasite! Hey, I just thought of something...You like superheroes (especially those without powers) and you like purple...So, you like the Phantom and Alicia Keys' music video for 'Try sleeping with a broken heart'? The only good thing about Valentine's is candy and that's it. I shall spare you my anti-Valentine's Day rant. Yes, I like The Phantom! But more because he's an old pulp hero. I love the old skool take-down-gangster-type heroes. I'm psyched for the SyFy Phantom show that's coming up and hope it won't disappoint. I never saw that music video so I just looked it up. (I kinda live in a cultural bubble.) And ooooh, purple water.... Alicia Keys is so talented. I really do like her, even though I mostly listen to non-vocal music. When I grow up and become a big time comic book creator, my main crossover/fame whore hero will be draped in purple for that exact reason. The Phantom and Catwoman can't just corn the market on purple clad super-heroes! SyFy and disappointment are, as I understand it, synonyms. Unless you're looking forward to Phantom as M.A.N.T.I.S.? The SciFi channel IS disappointment. I'm still hurting over The Invisible Man. I loved that show...it was a good show, which they cancelled for no reason.